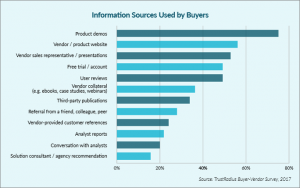 However when it comes to B2B buyers, specifically those looking to purchase tools and software from technology vendors, while independent research is a major trend, 60% say their vendor is an influential part of the purchasing process, according to TrustRadius’ new report, The B2B Buying Disconnect. Of course, that’s not the whole story. 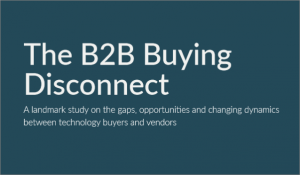 While technology vendors—namely their marketing and sales teams—play an undeniably important role in the purchasing process, they may be missing the mark or leaving opportunities on the table by focusing on the wrong things. And that’s precisely what TrustRadius’ study aimed to uncover.